Antoinette de Stigters gallery Art Affairs presented the Czech artist Zdenek Sykora in a one man show at Art Cologne 2006. Antoinette de Stigter talks about the concept behind his work, the longtime collaboration with the artist, and the reception of his work. Art Cologne 2006, November 2, 2006. Sykora was born 1920 in Louny, then Czechoslovakia, today Czech Republic. He studied arts and crafts and descriptive geometry at the Charles University in Prague. 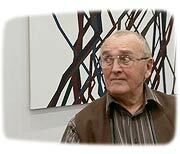 In 1952 he had his first individual exhibition in Prague with works mostly showing landscapes from the Louny region. In 1964 he started a cooperation with the mathematician Jaroslav Blazek which lasted for several years. In 1968 he participated in the 4. documenta in Kassel. In 2005 he was awarded the Herbert-Boeckl-Prize for his lifelong work. He lives and works in Louny, Czech Republic. “Several times in my life I had a feeling that I had gone astray in my work. I was slowly drawn into every new situation by forces that I could not, and even didn’t want to resist. The new results always made a strange impression on me, though they were created spontanously and were not a result of any decision or intention. It always took me some time o begin to understand them, and I realized that they had preceded in my mind.” Zdenek Sykora, 1985.